I have been thinking a lot about my dealbreakers- those things that make me immediately walk away from an opportunity to exhibit or sell my art. I know people who make these for relationships with people/dating, and it seems only logical to know when to politely decline an opportunity that smells fishy- they do exist! As I try to create a finer work I try to find a more protective, caring environment that likes it and wants to sell it to good homes. This is a daunting task, because I am at a point where the places I want are still hit-and-miss about wanting me- it really is a lot like courtship, ya know since everyone is thinking about Valentine's Day right now anyway... I am probably working the hardest at submitting to venues that are appropriate for my niche/market, and most of them are not within driving distance so I have to show them the best representation of my work, while gauging which ones are still a good fit. Sometimes another area's definition of certain genres differ from some Oklahoma's definitions/perceptions, so I rely a network with out-of-area contacts has helped put a lot of the regional feedback I have received in perspective. If you are reading this and you are someone from outside "the 405" that has helped me even by offering up some helpful business advice, you are invaluable to my work and I cannot thank you enough! 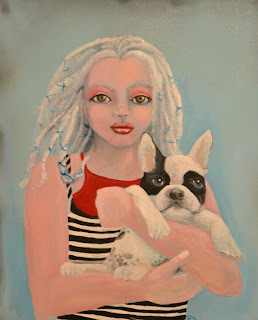 I did a little painting this weekend- I have really wanted to paint a French Bulldog. These are the most adorable little doggies (I am a sucker for pups with short legs, kinda like me!). Also Sit.Stay.Art! is coming up and I have had many stories of abandonment and adoption cross my inbox and my Facebook pages. In case you didn't know, I myself am an adopted kid, and I know how it feels to be chosen and live with feelings of both want and un-want (sometimes themes of "selection" creep into my paintings) This one is partially complete, as it has a handmade frame to be made for it (I am excited about making my own frames this year! ), but I am happy with the painted image- it was on a repurposed canvas that had some paint on it that I decided to go in this direction- the new image is acrylic and spraypaint. Did you know I offer pet portraits too? I will be making a piece myself for Sit.Stay.Art! 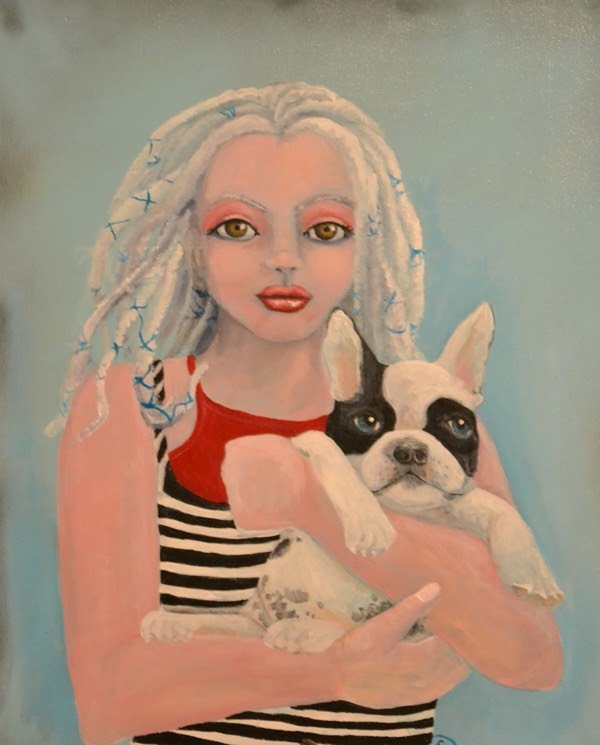 in June portraying a shelter pet from Pets and People and I hope to have some animal pieces on display in Dallas when I get more details on that (I can't wait to spill but I must wait until I have the concrete details!)... In the meantime you can still find other animal art at Green Bambino! Was it business as usual for you this weekend or did you complete a special project?